St. Martin's Griffin, 9780312538910, 320pp. With a poet's clear eye and a journalist's curiosity about how a city works, Dan Barry shows us New York as no other writer has seen it. Evocative, intimate, piercing, and often funny, the essays in City Lights capture everyday life in the city at its most ordinary and extraordinary. Wandering the city as a columnist for The New York Times, Barry visits the denizens of the Fulton Fish Market on the eve of its closing; journeys with an obsessed guide through the secret underground of abandoned subway stops, tunnels, and aqueducts; touches down in bars, hospitals, churches, diners, pools, zoos, memorabilia-stuffed apartments, at births and funerals, the places where people gather, are welcomed, or depart; talks to the ex-athlete who caught the falling baby, the performance artist who works as a mermaid, the octogenarian dancers who find quiet joy in their partnership, and the guy who waves flags over the Cross-Bronx Expressway to wish drivers safe passage. Along the way, Barry offers glimpses of New York's distant and recent past. He explains why the dust-coated wishbones hanging above the bar at McSorley's Old Ale House belong to the doughboy ghosts of World War I. He recalls a century of grandeur at the Plaza Hotel through the tales of longtime doormen who will soon be out of a job. He finds that an old man's quiet death opens back into a past that the man had spent his life denying. And, from the vantage of the Circle Line cruise around Manhattan, he joins tourists as they try to make sense of still-smoldering ruins in Lower Manhattan three weeks after September 11, 2001. 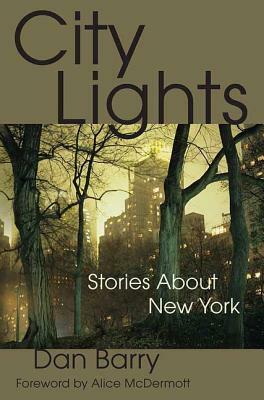 Each story in City Lights illuminates New York, as it was and as it is: always changing, always losing and renewing parts of itself, every street corner an opportunity for surprise and revelation. Dan Barry wrote the weekly column “About New York” for The New York Times from June 2003 to November 2006, and now writes a national column for the Times called “This Land.” He was a nominated finalist for the 2006 Pulitzer Prize for Feature Writing for his coverage of New Orleans following Hurricane Katrina and for his coverage of life in New York City, and shared the 1994 Pulitzer for Investigative Reporting while working at the Providence Journal. He is also the author of a memoir, Pull Me Up. Born in New York and raised on Long Island, he lives with his family in Maplewood, New Jersey.